We have Just Sold out of Star Wars Galactic Heroes Resistance vs. First Order Figure Pack. Not to Worry! Fill in the Notify me When Available and you will be the first in line for our restock of Star Wars Galactic Heroes Resistance vs. First Order Figure Pack !! From the Star Wars collection by Hasbro. Star Wars Galactic Heroes Resistance vs. First Order Figure Pack. 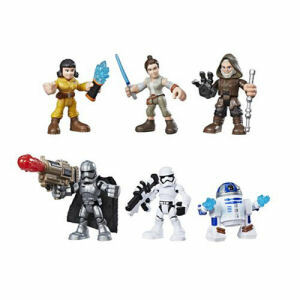 This set includes Rose - Rey - Luke Skywalker - Captain Phasma - First Order Stormtrooper - R2-D2. Each Galactic Heroes figure has jointed wrists - legs - shoulders - neck. They measure 2 inches tall.